PageBoy Magazine: What is a What is a What is a train? What is a What is a What is a train? "... avant-garde works must remain wild and never neglect an opportunity to attack their trainers; above all, it is the hand that feeds them which must be repeatedly bitten. They have to continue to do what the avant-garde is supposed to do: shatter stereotypes, shake things up, and keep things moving; offer fresh possibilities to a jaded understanding; encourage a new consciousness; revitalize the creative spirit of the medium; and, above all, challenge the skills and ambitions of every practitioner. Such a pure avant-garde must not only emphasize the formal elements of its art (recognizing that these elements are its art); its outside interests must be in very long-term - if not permanent - problems. It may have to say no to Cash, to Flag, to Man, to God, to Being itself. It cannot be satisfied merely to complain of the frivolities of a king's court or to count the crimes of capitalism or to castigate the middle class for its persistent vulgarity. 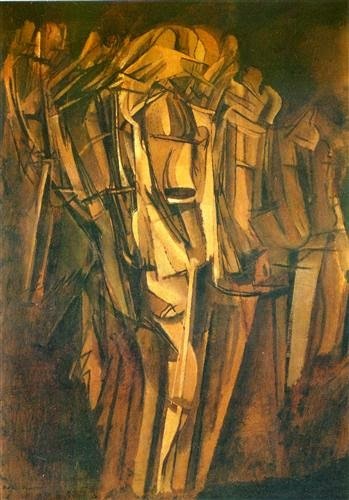 The avant-garde's ultimate purpose is to return the art to itself, not as if the art could be cordoned off from the world and kept uncontaminated, but in order to remind it of its nature (a creator of forms in the profoundest sense) - a nature that should not be allowed to dissolve into what are, after all, measly moments of society."